Looking for options to serve your draft beer home brew on the go? Here’s a roundup of some of the available options for your next tailgate, party or get together. 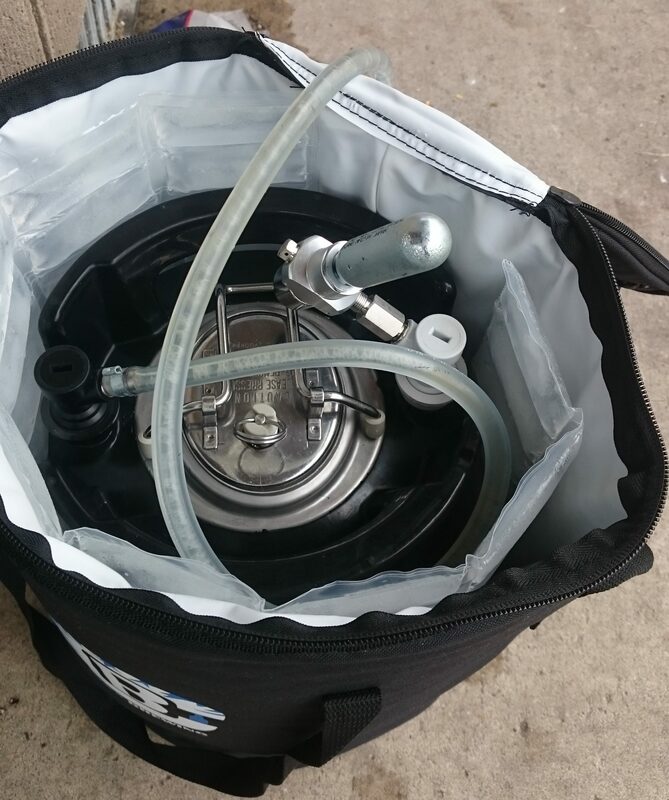 One of the easiest options to serve your homebrew on the go is filling up a growler. See below for tips on getting a good growler fill. Standard growlers are easy to be had and… easy to break. This section focuses on stainless steel models. All of these are vacuum insulated. Vacuum insulation helps keep beer cold for a long, long time (I’ve seen quoted times of 24+ hours – that’s going to be dependent upon conditions) and also resists or completely eliminates sweating. These also generally look amazing. They’re also great because you can take them to the park, beach or pool without being concerned about broken glass. via William’s Brewing. Double Wall Vacuum Insulated Growler along with dispensing head, tap and CO2 injector cartridge. Carbonation caps allow you to pressurize your beer inside of a compatible 1 or 2 Liter PET bottle for quick carbonation and transport. Fill the 1L or 2L Bottle just like you would a growler, put on a carbonating cap and pressurize for easy transport. You can squeeze the bottle to expel extra head space prior to pressurizing with CO2. When you pressurize the head space is filled up with CO2. You can also use carbonation caps to help fine tune carbonation levels or force carbonate quickly. Note: When multiple suppliers are mentioned, products may not be identical to the pictured item. The Carbonator (sometimes called the CarbaCap) – Plastic. Fits 28mm PET Bottles. This has a built in ball lock connection so you can hook it right up to your [ball lock] kegerator CO2 lines. Kent Systems Soda Bottle Cap and QD via MoreBeer. This system works with both ball and pin lock setups. Just add a tee to your CO2 line [or otherwise hook the QD up to your gas system] and use to pressurize. The QD and caps are available separately so you can obtain multiple caps economically. One QD can work with as many caps as you need. 38 MM Carbonator Caps – Similar in function to the smaller caps mentioned above, 38 mm caps fit on Tap A Draft bottles and many 3 Liter PET Bottles. Small kegging setups that lend themselves to easy transport. You can either fill from your kegerator or bottle condition directly in these. The BeerBox uses 2.75 Gallon food grade HDPE Containers. These are sized to easily fit in a refrigerator or cooler. Each container contains an integrated port for a CO2 injector. Multiple tap styles are available. You can condition and carbonate directly in these or fill from your larger kegging system. Small and Micro Kegging Systems at William’s Brewing. Available in 1.75 and 2.5 gallon sizes, these setups include a small ball lock keg, faucet and regulator. Everything you need to serve your keg on the go. The Party Pig uses 2.5 Gallon PET Bottles along with pressure pouches. The pouches take the place of CO2 that would normally be required. Filling a growler or small draft dispenser from your draft setup is an easy and straightforward process. Now we transition into solutions for serving full Cornelius kegs of beer. Combine your keg full of homebrew with some sort of faucet and a CO2 source. These are nice because they generally look and work great and take up minimal space. Flow Control Faucet via Keg Connection. This handheld faucet has built in flow control. Variable flow control means you can change the resistance that this faucet provides. That’s great for high carbonation beers and it also means less tubing. Stainless Draft Beer Gun – from William’s Brewing. A high quality replacement for a picnic or cobra style faucet. Draft Jockey Boxes: These are for serving beer that isn’t necessarily cold yet. Ice in the cooler gets beer down to serving temperature quickly. Now that we have a faucet that works on the go, we need some sort of pressurization system. Of course you could lug around your full size CO2 tank and regulator, but this section focuses on options that are easy to transport. One relatively cheap fitting let’s you re-purpose a spare keg for use as a portable CO2 source! Using a Keg as a CO2 Source for Portable Serving! Torpedo Pressure Pack from MoreBeer. The Torpedo Pressure Pack includes a mini CO2 regulator that uses 74 gram cartridges along with a stainless ball lock QD. All the features (and more with the SS QD) of the previously mentioned regulator. 0~60 Psi Home Brew Premium Regulated Co2 Charger Kit Anodised Aluminium Body – via Amazon. Made of machined, anodized aluminum and uses 3/8″ threaded 16 gram co2 cartridges. MFL threaded connection to add your own pin or ball lock QD. Includes a ball lock quick disconnect. Since it has an MFL fitting, you should be able to swap that out for a pin lock QD. Photo via Using a Keg as a CO2 Source for Portable Serving! The Adapter II Paintball Gauge. 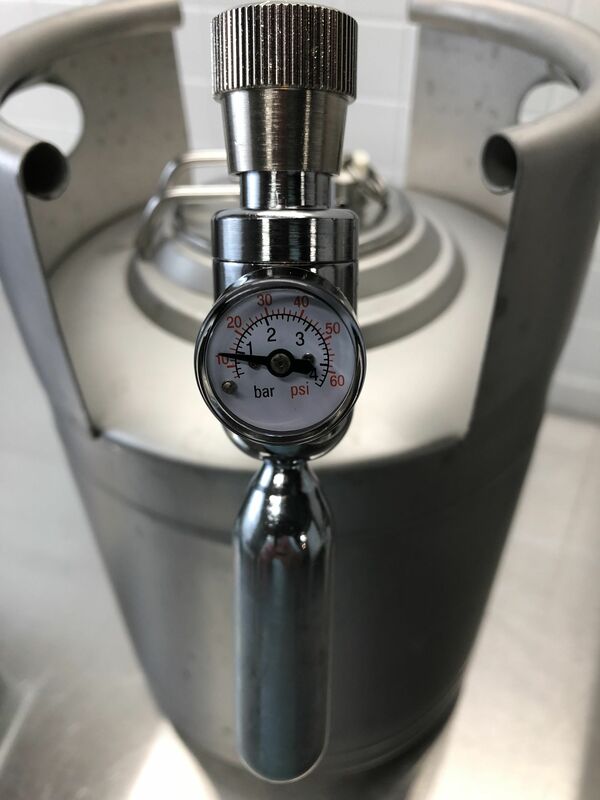 Use a compact Paintball CO2 tank to dispense your beer using this CO2 regulator designed for the task. Much more portable than your 5, 10 or 20 lb tank. Misc Tank Adapters. Adventures in Homebrewing has a number of adapters that allow you use use other types of tanks and regulators together. The selection includes the pictured adapter that allows you to use a Sodastream tank with your CO2 Regulator and adapters that allow you to use paintball tanks with your CO2 Regulator. Check out AIH’s CO2 Tanks and Accessories Page for more info. Ball Lock Cornelius Keg Hand Pump. If you know you’re going to go through a whole keg, or multiple kegs, this hand pump is a great option. No tubing or CO2 to bother with. Of course, it’s going to cause oxidation, but that doesn’t matter if you’re drinking the beer quickly. Smaller, typically 2.5 to 3 gallon, more portable versions of the Cornelius-style kegs you know and love. These kegs usually fit well in a 5 gallon bucket. Fill with ice and you’re good to go. AIH New Double Rubber Handle 2.5 Gal Keg – Brand new 2.5 gallon ball lock keg. Kegs at William’s Homebrewing. William’s has 1.75 and 2.5 gallon ball lock kegs. Torpedo Kegs from MoreBeer are available in 1.5, 2.5 and 5 gallon sizes. These are brand new ball lock kegs. The neat thing about this is that they stack with fittings on. That means you can get multiple kegs in the same footprint as one. Typically small ball lock kegs cost more than 5 gallon kegs. Torpedo Kegs are an exception. Also, all sizes ship for free to most US addresses. There are some systems on the market that are designed with portability in mind. Torpedo Keg Party Bomb from MoreBeer. Available in 1.5, 2.5 and 5 gallon sizes. Includes a keg, mini CO2 regulator and faucet. Sometimes you just want to throw some beer or a growler into a cooler. Cooler Shock Gel Packs – In my opinion… these are amazing. The are made of thick mylar and come in several sizes and configurations. Some are pre-made and others are DIY. For the DIY versions you add the water to finish them off. A 5-6 gallon bucket with ice has worked well for me. Some of the cube and beverage coolers fit smaller 2.5 and 3 gallon kegs well. Jockey Boxes are also an option. Some insulating keg wraps are available as well. One of those to take a look at would be Great Fermentations Xtreme Keg Wrap. That is a lot thicker than most on the market and as such keeps 5 gallon kegs colder for longer. Get it in place ahead of time and let it settle. Transfer clear beer to a new keg and leave yeast and trub behind. This entry was posted in CO2 Hardware, Draft, Draft Top Picks, Faucets, Kegs, Portable Serving, Reviews & Top Posts, Top Posts on March 19, 2012 by admin.